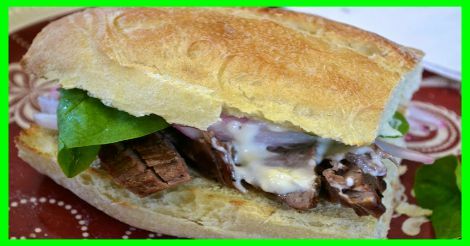 I am always on the lookout for a good steak sandwich recipe, so when I came across this recipe from "Cooking Light", I knew I had to try it. I did not have the exact ingredients on hand, so I substituted with what I did have. It turned out great! Combine first 3 ingredients in a microwave saft bowl. Microwave for 2 minutes on high or until boiling. Stir in onion and let stand at room temperature for 30 minutes. Combine mayo with the next 4 ingredients ( through garlic) and set aside. Rub steak evenly with oil and sprinkle with salt and pepper. Grill until desired doneness. Let steak stand for 10 minutes. Slice thinly across the grain. Hollow out each baguette piece on top and bottom. Place baguettes, cut side down on grill rack and cook for 1-2 minutes or until toasted. Drain onion mixture and discard liquid. Place steak on bottom halves of baguette. Top with onion and spinach. Spread mayo mixture over top halves of baguette; place on sandwiches.